In 1992, Taos Pueblo in New Mexico was admitted to the World Heritage Society as one of the most significant historical cultural landmarks in the world, thereby joining such sites as the Taj Mahal, the Great Pyramids, and the Grand Canyon. 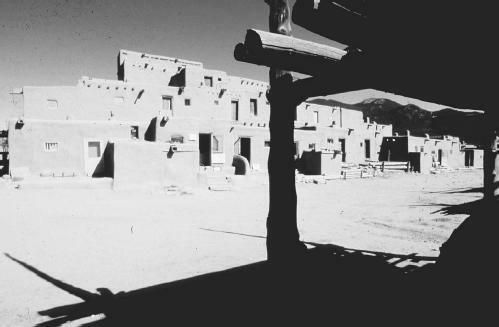 For many Native Americans and proponents of New Age mysticism, Taos Pueblo is also one of the primary spiritual structures on the North American continent, and it is a sacred place that does not yield its secrets to anyone other than members of the Pueblo. The main part of the Pueblo looks much as it did when it was built with sun-dried adobe bricks around 900 years ago. The two five-story houses, the Hlauuma (North) and the Hlaukwima (South), are believed to be the oldest continuously inhabited communities in the United States. Although there are more than 1,900 Taos Indians living on the 99,000 acres belonging to the Pueblo, only about 150 people live within the Pueblo itself on a full-time basis. Because the Pueblo traditions forbid the utilities of running water and electricity, many choose to live in more modern homes outside the old walls. Still others prefer to live near the fields that they work on Pueblo land. The religion of the Taos Pueblo people is extremely complex, yet as many as 90 percent of them also practice Roman Catholicism, finding no conflict between the two forms of spiritual expression. St. Jerome (Geronimo) has been the patron saint of the Pueblo since the church dedicated to him was first built there in 1619. The original church was destroyed in 1680, rebuilt on the same site, demolished again during the War with Mexico in 1847, and restored again in 1850.
can be seen in the calendar of festivals for the year. For example, dances celebrating the turtle, deer, or buffalo are interspersed with dances honoring St. Anthony, St. Jerome, and the Virgin Mary. All of these events are considered serious religious ceremonies. Cameras are forbidden, and the Tribal Council asks that visitors render the same respect toward the dances and rituals as they would during a solemn service in their home churches. Each year the Tribal Council, a group of 50 male elders, appoints a tribal governor and a war chief. The tribal governor and his staff are responsible for the civil and business interests of the tribe, and the war chief and his men see to the security of the mountains, the Pueblo, and the land holdings outside of the old city walls. While some tribal members work in the nearby town of Taos, many of them staff the traditional craft and art concessions at the Pueblo. Pottery, silver jewelry, and paintings by local artists have been world famous, and ever since the beginning of the twentieth century, scores of non-Indian painters, writers, and photographers have visited Taos and made it their home. In the 1960s and 1970s, Taos became a revered scene for the counterculture, the socalled "hippies," and many stayed on to become contributive members of the community. In 1970, the U.S. Government returned 48,000 acres of mountain land, including the sacred Blue Lake, to the people of Taos Pueblo. The federal government had confiscated the land in 1906, declaring the area to be part of the National Forest lands. Such desecration of holy land had caused great spiritual turmoil among the tribe, for Blue Lake was perhaps the most important of the ritual sites their people visited for ceremonial purposes. When the land was returned to the tribe after years of constant lobbying by the Pueblo leaders, the tribe felt that a good part of their spiritual and cultural well-being had been restored to them. Today, Blue Lake and the nearby mountains are off-limits to all but members of the Taos Pueblo. Taos Pueblo welcomes visitors except during those times when tribal rituals require privacy; however, there are a number of ceremonies and powwows that are open to the general public. When visiting the Pueblo, one must keep in mind that the tribal members regard themselves as a sovereign nation within the United States and that their primary objective as a tribe is to preserve their ancient traditions. The Tribal Council has posted a number of rules that must be observed at all times and indicated certain areas that are strictly offlimits to all visitors. Deloria, Vine. God Is Red. New York: Grosset & Dunlap, 1973. Fergusson, Erna. Dancing Gods: Indian Ceremonies of New Mexico & Arizona. Albuquerque: University of New Mexico, 1931, 1957, 1966. Horka-Follick, Lorayne Ann. Los Hermanos Penitentes. Los Angeles: Westernlore Press, 1969. Steiner, Stan. The New Indians. New York: Dell Publishing, 1968. "Taos Pueblo: A Thousand Years of Tradition." Taos Vacation Guide. [Online] http://www.taosvacationguide.com/history/pueblo.html. 2 May 2002.